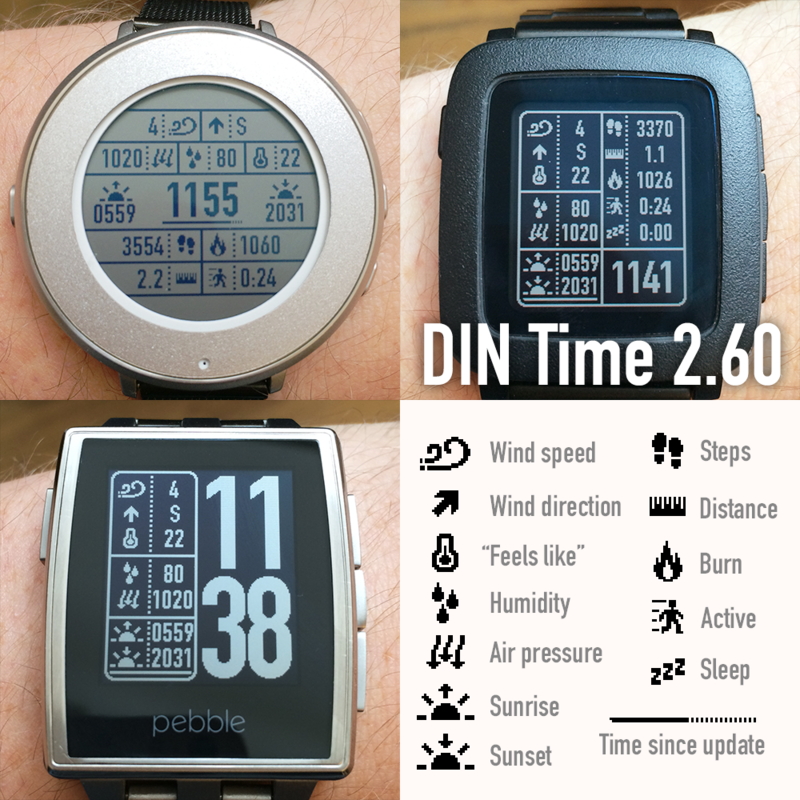 Version 2.60 of DIN Time, available now, finally adds health data (on supported devices) to DIN Time, along with more weather data! To see extended weather and health data you need to shake your watch, twice. Just like when you would activate the backlight by motion, if you have that option enabled. And then once more. You will then see a popup with lots of tiny icons and data! Please see the help screen in the settings page for more information about what the symbols and values represent. I realize many of you would rather see their health data on the main screen, but that will have to wait until a later version. Support for custom location (GPS free) when using Forecast.io. In plain text! No more woeid’s when using Yahoo! Just enter your location in plain text! Fixed weather icon sometimes not switching to day version. Added Russian and Czech languages. Fixed problem with weather not being completely hideable on Round. Also, as always, many thanks to @rozboris for his continued help with the settings page! DIN Time 2.50 is available now, and it finally allows for Forecast.io as an alternate weather provider. For this to work you need to register for a free personal API key on Forecast.io. Forecast.io will be a more accurate option for a lot of users, but requires the extra step of entering the API key in the settings page. This version has also been optimized to reduce memory usage, in preparation for the next version, which will to add more weather and health data. It looks like Yahoo decided to revert back to how its weather API worked before yesterdays change, but they broke something doing so. Temperature was only reported in Fahrenheit. A fix is out now for DIN Time, version 2.47, which converts the Fahrenheit reading to Celsius. We’re back to normal for a few weeks I guess, until Yahoo tries to do something again. Yahoo has made a major change to how their weather API works, so DIN Time (and probably many other watch faces and apps) can’t update the weather data. I’m looking into what can be made to get it up and running again. I’m happy to report that the changes I made to DIN Time on February 13 (v 2.46), which aimed to lower the amount of Nominatim geolocation requests, helped. All DIN Time users requests combined are now only 7-10% of what they used to be! I suppose this means most people, unsurprisingly, stay in the same location most of the day. DIN Time 2.46 includes improvements and changes to help ensure an uninterrupted geolocation service. DIN Time is too popular for its own good. With the large amount of DIN Time users we’re making too many geolocation requests per hour and risk blocking from Nominatim, the free geolocation service I’m using. DIN Time will now detect if you are in the same location as the last time the weather updated. If so, no new geolocation request is sent. Please note: If this change isn’t enough I will also need to limit the update frequency to every 60 minutes in the next version. Also, another change in this version is if the GPS isn’t available and no woeid is entered, DIN Time will now use the location of the last successful weather update. Version 2.45 of DIN Time fixes an issue with geolocation which caused the weather updates to fail if using GPS. Available now. For no apparent reason this xkcd comic came to mind when I was trying to optimize DIN Time the other day. DIN Time 2.44 is now available with a fix for the geolocation issue! Thank you Freakified, author of the TimeStyle watch face for the solution! Pebble users that are still using pre-timeline firmware unfortunately can’t enjoy this update. You’re stuck using a woeid. Or just update your watch.